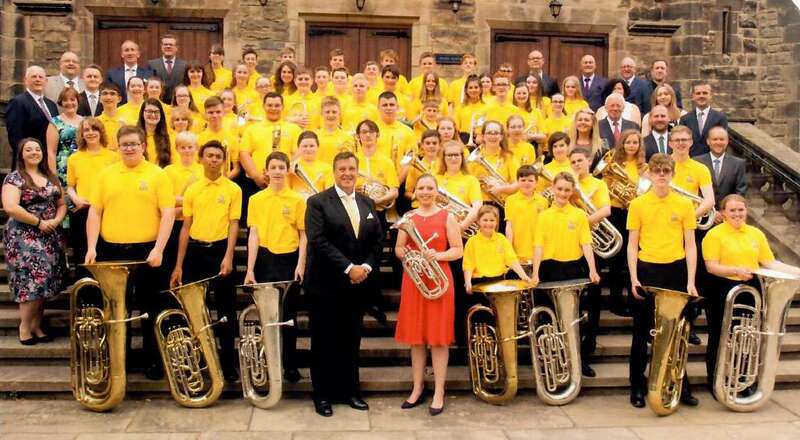 The National Children’s Brass Band of Great Britain (NCBBGB) and Music Director, Nicholas Childs had been preparing all week for this concert, often in rehearsal temperatures as hot as 32 degrees Celsius! On the day of the concert Repton School’s 400 Hall was packed, and the temperature was no less! However, the standard of the programme and performance was equally as high; from the first note of Curnow’s Fanfare and Flourishes to the finale, Philip Harper’s The World’s Greatest Storyteller, the band and conductor had the audience spell-bound. The programme featured two substantial works, a World première of Repton Fantasy by Jonathan Bates, and a UK première of Peter Graham’s Heroes of the North. Both were performed with integrity and a high degree of expression, as all the soloists displayed musical maturity beyond their years. If the first half was serious, the second half allowed the young musicians to let their hair down a little, with the inclusion of Strauss’s Tritsch Tratsch Polka, Under the Boardwalk (directed by cornet tutor, Tom Hutchinson) and I’m a Believer (directed by horn tutor, Owen Farr). For this listener, two stars of the show included Lewis Barton - the band’s young principal cornetist who was impeccable throughout the whole concert, and Lily Strentz - a tiny tuba player who came to the front of the stage and climbed three steps to be the ‘Bell Soloist’ in a brilliant rendition of Sousa’s Liberty Bell. Guest soloist, Katrina Marzella was in scintillating form in Philip Sparke’s evocative Scaramouche, and brought the house down with Bellstedt’s old warhorse, Napoli. The Black Dyke baritone star ably demonstrated why she is considered to be the best baritone player in the world; her tone was velvety, her technique unequalled and, she finished Napoli on a magnificent super F! As is customary, several awards were presented during the concert: Percussionist Owen Parr won Most Outstanding Player; Edward Culpin won the Euphonium/Baritone prize, and Daniel Marsh won the Betty Anderson Award. All in all this was a fantastic afternoon of music making. The programme was imaginative, the playing was terrific and the atmosphere was electric. Well-done to everyone involved: conductor, soloist, music staff, house staff, administrator Philip Biggs, and especially the young musicians. Congratulations!